Towering peaks surrounding glacial lakes; small towns surrounded by farm fields with the sound of cow bells echoing. Switzerland is home to the most dramatic landscapes in central Europe. In Zermatt enjoy the leisurely pace of a carless town that sits at the foot of one of the world’s most recognizable peaks, the Matterhorn. Ride chairlifts up for commanding views of the mountains, valleys, and glaciers. Enjoy one of the world’s greatest rail journeys on the Glacier Express as we make our way towards St. Moritz. Next up, a day trip on the Bernina Express to enjoy even more incredible scenery. From the heights of the Alps to the calm waters of the Italian Lake District. Our hotel is located right on the shore of Lake Maggiore to enjoy the views. Enjoy a cruise on the lake to see the gardened Isles of Bella and Madre. Join us as we journey, by rail and coach, through this magical region. Group members gather for the overnight direct flight to Zurich, Switzerland's largest city. This morning climb aboard the Gornergrat Bahn cogwheel railway, the highest train in Europe, and ascend to a summit far above Zermatt to experience one of the best viewpoints in the Alps. Admire a gorgeous view that includes Monte Rosa, the Matterhorn, and the Gorner Glacier. Hike down past Alpine lakes to Riffelberg, where we will catch the train back to Zermatt. Enjoy a visit to the Matterhorn Museum, where a local mountaineer will recount stories of early attempts to conquer the Matterhorn and other climbing adventures. Today we start the day with a walk through the village of Zermatt. In the afternoon, ride the gondola up to Schwarzsee or Furi for a walk through the spectacular Zmutt Glacier Valley. Later, return to Zermatt by gondola. This morning we set out on a walking tour of Pontresina and discover local lore that dates back to prehistory. Later this morning, travel to St. Moritz by local train, and visit the Segantini Museum, dedicated to the Alpine artist Giovanni Segantini. After lunch on your own, take the rest of the afternoon to explore the picturesque valley of St. Moritz before returning to Pontresina. Ride the famous Bernina Express, the highest mountain railway in the Alps, to the heart of Italian-speaking Switzerland. Take in the extraordinary views of the Morteratsch Glacier from the train’s panoramic windows as we climb to the highest point at Ospizio Bernina, 7,578 feet above sea level. Descend to the town of Tirano, where we meet a local guide for a tour of its charming historic centre. Return to Pontresina via the Bernina Express late this afternoon. 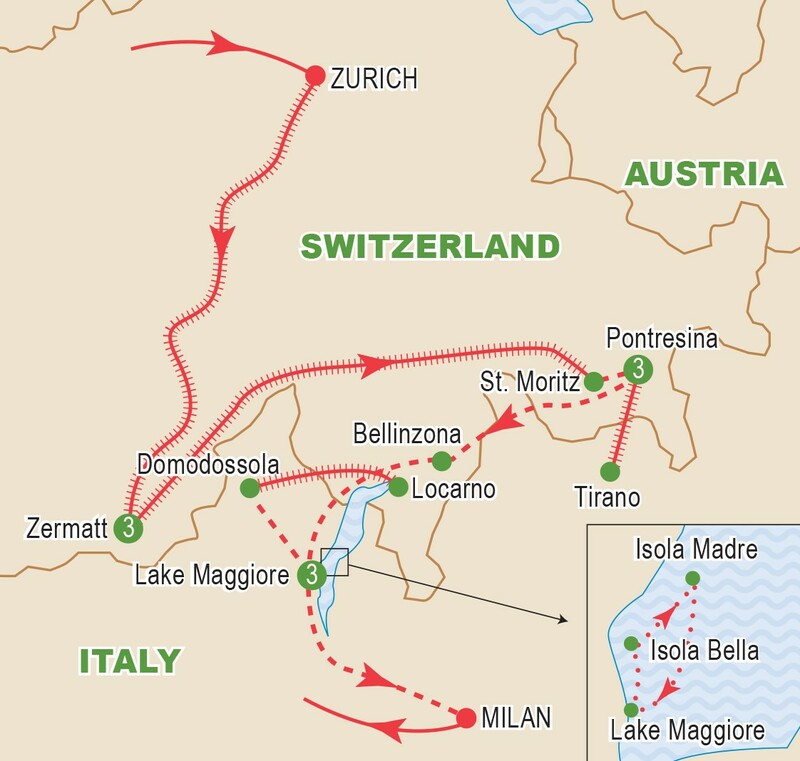 A trip through nostalgia and romanticism: The two-hour journey from Domodossola to Locarno with the Centovalli Railway is the shortest and most beautiful connection between Lake Maggiore and Bern. This panoramic train journey through the picturesque “One Hundred Valleys”, passing deep gorges and crevices with glittering cascading waterfalls, travels across colourful alpine meadows, over numerous bridges, and through vineyards and forests of chestnut trees. Magical landscapes and lush vegetation, which change with the seasons, can be seen from the train. This is an unforgettable, varied, fascinating, comfortable and exciting journey. Isola Madre and Isola Bella are blooming oasis immersed in the blue of Lake Maggiore. They used to be the location for the ceremonies and the feasts of the nobles, while today they are elegant estates which are open to the public. They are the most impressive islands in the archipelago. They were named after the Borromeo family, the noble lineage that acquired them in the 14th century and transformed them with baroque palaces and rich gardens. Visit the Palazzo on Isola Bella presiding over 10 tiers of spectacular terraced gardens roamed by peacocks. This baroque palace is arguably Lake Maggiore's finest building. Wandering the grounds and the first floor reveal guestrooms, studies and reception halls. Particularly striking rooms include the Sala di Napoleone, where the emperor Napoleon stayed with his wife in 1797. After breakfast, transfer to Milan’s Malpensa Airport for our flight home. Tour price is based on sharing a twin-bedded room at hotels. Prices are based on a minimum 20 members and on rates, taxes and fees effective February 2018 and are subject to change due to factors beyond our control. Group to be escorted with a minimum of 20 travellers. Prices DO NOT INCLUDE the cost of insurance which is available and is highly recommended. Premiums vary with the cost, length of the trip, and the traveller’s age. For passengers up to and including 74 years on departure date, premiums will range from $280 to $383 pp plus applicable taxes. Cost supplements for travellers aged 75-85 will range from $186 to $375 pp plus applicable taxes. This insurance is effective from the date of purchase and carries limitations on pre-existing medical conditions. Please discuss your insurance coverage prior to booking. Refer to our Terms and Conditions for more information.